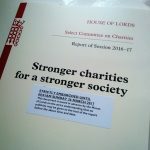 The House of Lords appointed a Select Committee on Charities, to consider issues related to sustaining the charity sector and the challenges of charity governance, on 25 May 2016. The Committee was appointed with a reporting deadline of 31 March 2017. R osie was appointed as the specialist adviser to the Committee, to assist the Committee in carrying out their review by providing a readily available source of expert and impartial advice. The Committee published their report ‘Stronger charities for a stronger society’ on 26 March 2017.